Beautiful, leafy kale (Brassica oleracea) is right up there with its more famous cousins, spinach and broccoli, in the top echelon of healthy vegetables. Just look at the numbers. One cup of cooked Kale has a meager 32 calories, but also provides over 1000% of daily value of vitamin K, 100% of vitamin A and 70% of vitamin C. Like broccoli, kale is touted as a cancer-fighting food for three different reasons. antioxidant nutrients including carotenoids and flavonoids. Organic kale is pricey in the supermarkets, but there’s no reason you can’t plant this cruciferous veggie in your backyard garden. It’s easy to grow and the crop keeps giving for months. No member of the cabbage clan is easier to grow than leafy kale. It’s a cool weather crop you can plant in spring or fall. If your region gets very cold in winter, set out your kale shoots in spring. You can even set out young plants at the tail-end of winter as long as you protect them on chill-wind days with row cover. Spring-planted kale keeps on producing leaves until the weather gets too warm. If winters are mild in your area, you’ll do better to plant kale in fall. The plants keep producing new leaves for months, and the cooling temperatures brings out kale’s delightfully nutty flavor. Kale likes well-drained soil rich in organic material so work several inches of composted manure or organic compost into the soil before you begin planting. Select a garden bed with full sun for the biggest and most vigorous plants. If your entire backyard’s in partial shade, grow kale anyway. It won’t get as big but it will get big enough to eat. You can either buy kale starts at the garden store, or else plant seeds yourself indoors in winter. Regardless, when you transplant them into the garden, set them at about the same level as they were in their containers, spacing them 18 to 24 inches apart. Add a 2-to-3-inch layer of mulch – organic compost or chopped leaves – to the surface of the soil, keeping it away from the plant foliage itself. Mulch helps the soil retain moisture and regulates the soil temperature. Water regularly, about one inch a week. Remember the story about the goose that laid the golden eggs? Think of a kale plant in the same way. You want to harvest leaves from the plant, not harvest the plant itself. Whenever you’re ready to have kale for dinner, use a scissor to snip off leaves. Begin with the oldest leaves from the lowest section of the kale plant, discarding any that are yellowing. Continue snipping your way up the kale stalk, harvesting as many leaves as you want. However, always leave at least four leaves at the top of the plant unpicked. This is the growing crown of the plant that will continue to produce leaves for months. The taste of your kale will vary from spring to fall, depending on the weather. Kale lovers swear that the leaves are sweetest just after a light frost. In USDA hardiness zones 7 through 10, kale produces new leaves all winter long. You may need to bring in row covers, more mulch or even growing tunnels to extend the season in colder zones. You’ve cut your first kale leaf harvest and washed the bright crinkly leaves carefully. At this point, you can store it in the refrigerator for up to a week, but it’s best when eaten the same day. Cut up the kale leaves into ½ inch pieces for cooking. Cut the stem portions into pieces half that size. The healthiest way to cook kale is to toss those chopped pieces into a steamer and let the steam from an inch of water cook them tender in five minutes flat. Toss with a dressing made of olive oil, lemon juice, and chopped garlic, then top with chunks of sun-dried tomatoes and sliced Kalamata olives. But chopped-up kale also tastes great added to veggie stir-fries, tossed into soups for the final few moments, sprinkled on pizzas and mixed into casseroles. Sauté kale greens with garlic and mix with pasta. Kale leaves are best if you cook them just enough to make them tender. 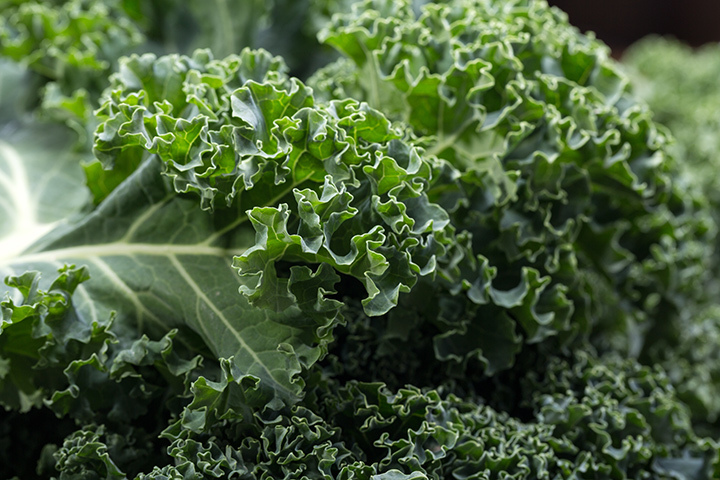 If you’re feeling adventurous, blend up tender kale leaves into a veggie smoothie. Another fun one to try is kale chips. Spray whole kale leaves with olive oil and bake for just a minute or two until they’re crisp.